I appreciate the interest from many people on Twitter in yesterday's Singapore elections post! So today I'll put up something discussing the dynamics of the current election, including contested districts and interesting candidates, in more detail. One big thing to keep in mind: We don't have pre-election polls of anything around here. One of my Singaporean colleagues was explaining to me today that this country is still in the early stages of building the kind of election-related media infrastructure that exists in the States. I think he liked my idea that this might be the time for an ambitious media entrepreneur to become Singapore's first political opinion pollster. In any case, we don't have anywhere near the kind of data that we'd have for an American election. The signs I have that the opposition is stronger than in the past -- first, that they're contesting many more seats, and second, that (according to my colleagues) there's more opposition mobilization and more worried noises coming from the ruling party -- could be totally misleading, or be the early signs of a huge opposition victory. And again, the opposition only has 2 out of 82 elected seats. If they get to 7, I think they'll be quite happy. 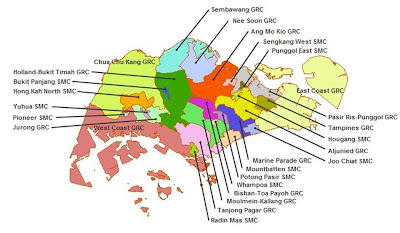 Here's a map of Singapore's districts. (Singapore is an island city-state of about 5 million people, with about the land area of New York City.) As described yesterday, they're mostly GRCs, where you vote for an ethnically balanced party slate of 4-6 candidates. In the smaller SMCs, you vote for a single candidate. The most exciting district this election is Aljunied GRC, inland on the east side of the island. The Workers' Party is fielding their all-star team there, in hopes of winning the first opposition GRC ever. Their 5 candidates include their one current MP, Low Thia Kang, who made a bold move in shifting out of his Hougang SMC seat to run on the Aljunied slate. They've also got Harvard-Stanford-and-Oxford-educated Rhodes Scholar Chen Show Mao and Workers' Party Chairman Sylvia Lim (could somebody get the lady a Chair?). The PAP is fielding a pretty good team too, led by respected minister George Yeo and including several of that district's incumbents. The PAP won the GRC by only a 56-44 margin in 2006 when Low and Chen weren't on the ballot, so it's possible that their addition will be enough to put the Workers over the top. 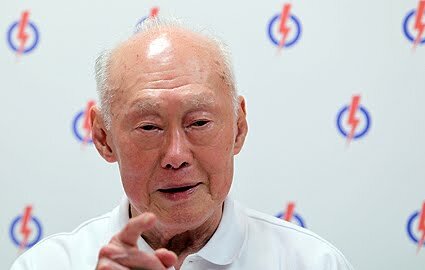 Speaking to reporters during a visit to Tampines on Friday night, MM Lee said, "If Aljunied decides to go that way, well Aljunied has five years to live and repent." The 87-year-old warned voters they would have to live with the choice they make come Polling Day on Saturday. You might read him as making the point that the Workers' Party representatives just won't be as good. But later he even made the threat a bit clearer: "We accept the verdict of the people, but they must also accept the consequences of their actions. You must expect the PAP to look after PAP constituencies first." The PAP is virtually certain to control Parliament no matter what happens in Aljunied, and the threat is that they'll ignore Aljunied's interests if the Workers' Party wins. Whether this will intimidate voters in Aljunied (and the rest of Singapore) into voting for the PAP or enrage them into voting for the opposition is something I'd be able to guess at a lot better if we had public opinion polls. George Yeo has been trying to apologize for LKY's threats and look like a good guy. One of my colleagues speculates that the opposition will hold onto Hougang SMC (basically enclosed within the Aljunied area) even with Low leaving for the GRC, since they carried the seat by a large vote in the past and the current candidate is likely to appeal to Low's voters. I don't know about the other opposition-held SMC seat, where a similar thing is going on with the MP leaving for a GRC slate. I guess this raises the worst-case scenario that the opposition gets wiped out of Parliament. Again, without polls, it's hard to predict, but I don't regard that as especially likely. First, there's the Holland-Bukit Timah GRC, where the Singapore Democratic Party slate includes Vincent Wijeysingha. He's the Executive Director of the migrant worker activist group Transient Workers Count Too, where my girlfriend is an active volunteer. He's also rumored to be gay, which was used in a whisper campaign against him by PAP incumbent Vivian Balakrishnan. Balakrishnan has also been criticized for his management of the Youth Olympic Games in Singapore. Opposition supporter Hun Boon has a concise run-through of all that on his blog. The PAP seems to have thought that Tin Pei Ling would appeal to young voters. It turned out like Republicans thinking that Sarah Palin would appeal to Hillary supporters. The target audience ended up being alienated and offended by the comparison. Nicole Seah ended up becoming the real youth icon, simply for being a competent candidate who expressed opposition views clearly, and because of the contrast with her opponent. It's still unlikely that the opposition will win this GRC, with a heavyweight like former Prime Minister Goh Chok Tong on the PAP slate. 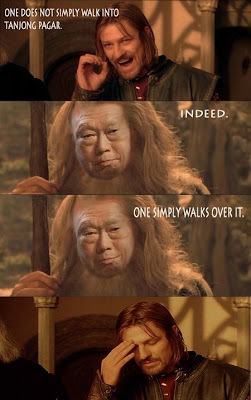 (He's the Prime Minister who served between LKY and his son -- you can remember them as the father, the son, and the holy Goh.) But if Nicole Seah can pull the opposition up enough and Tin Pei Ling can pull the PAP down enough, the GRC system could have come back to bite the PAP. Well, that's all I've got for you until tomorrow when I liveblog the results from a friend's election party. I guess I'll put the over/under on the number of seats the opposition wins at 5, with the note that the GRC system is designed to make the results extra chunky. Thanks for live-blogging the event and informing politically concerned Americans about the situation on a little tropical island. A little deflated at Tin Pei Ling getting into Parliament. Obviously not as disastrous as the hypothetical situation of Sarah Palin getting into the White House, since she is only one yes-man in a sea of 81 PAP MPs now. Still cannot see, for the life of me, any potential contribution to parliamentary debates coming from her; strikes me as someone who should be doing social work, but happens to have married Lee Hsien Loong's Principal Private Secretary. In other words, I honestly think that her positioning within the party is largely a result of her connections rather than any demonstrated ability. Such is politics, I suppose. The filthy side of it. On the other hand, We will have 6 opposition MPs and 3 NCMPs this time round. Getting 6 opposition MPs is a historical feat. I don't see the PAP losing power for the next ten years. I'd be okay with that if they were to make some fundamental changes to the way they try to preserve their political position. I would not be surprised to see them use the ISA if a general election were to get really close, such that they were at risk of losing power.